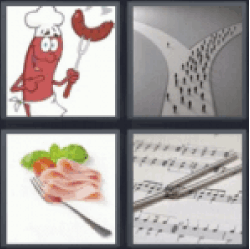 4 Pics 1 Word Cartoon of a cook sausage. Forking road. York ham, tomato and lettuce. Music sheet and fingerboard. Thanks for visiting 4-Pics-1-Word.com, here are the cheats for your favorite game. 4 pics 1 word Cartoon of a cook sausage. Forking road. York ham, tomato and lettuce. Music sheet and fingerboard.